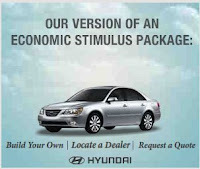 The Auto Marketing Blog: Who has the Biggest Stimulus Package? Now that the word bailout has been replaced with the friendlier stimulus word, marketers are ramping up on their messaging to work stimulus into their ads. Hyundai and Volvo are the first automakers to adopt the term. 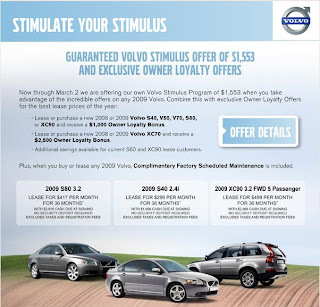 Volvo is running Tier 2 TV spots for regional dealerships with the language “Stimulate Your Stimulus”. Not sure what that means since no one is really getting a stimulus unless you are AIG or a major financial institution, that issue aside, it does seem like a very weak message. They are also using the phrase in their email marketing efforts. Hyundai is simply adding some stimulus language within their online media efforts to promote their well-received Assurance program. Unfortunately, there is a logic issue with the stimulus language for marketing purposes. The stimulus effort is a policy effort to help stave off unemployment and foreclosures. Adding a car payment to one’s financial situation is counterintuitive to the whole concept of a stimulus. Of course, I understand the language in the ads is to promote cost savings by putting money on the hood and reducing financing rates, but with so much contempt for buying big ticket items it seems attaching the word “stimulus” to your message to get people to spend $20,000-$40,000 is not a compatible concept.